Your bar cart isn’t stocked for Halloween?! OH THE HORROR!!! What’s more Halloween than a giant skull filled with vodka? Maybe some Bloody Mary Mix or a tiny skull adorned bar spoon? 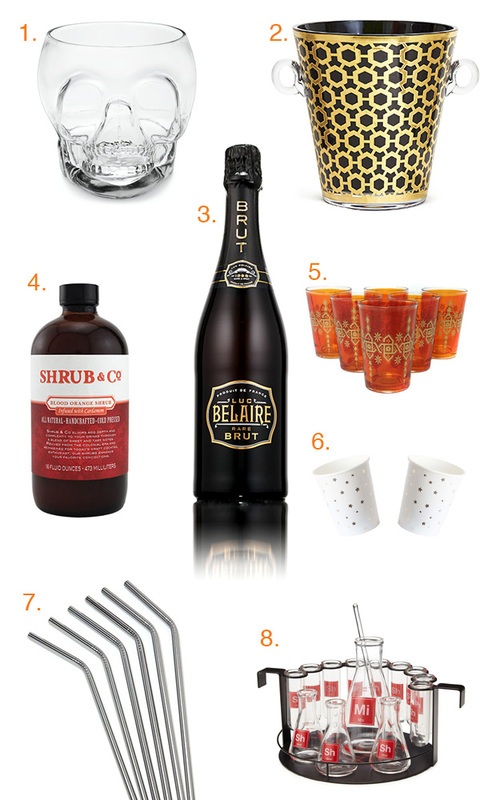 We’re stocking our bar cart this year with some matte black and smoky glassware. OK and yes, just a touch of gold too. And our cocktail toppers? Wax vampire teeth of course! After all it is Halloween. Let’s get spooky! I’m back east right now visiting with family in New England and everywhere I go I am reminded of just how much more it feels like Autumn. Besides the fact there is an actual chill in the air, we drive by corn mazes and apple stands and people really deck out their houses for Halloween. Entire towns decorate for Halloween. I’m trying not to think about the 90° temps that we will be returning to in Southern California. For now, I’m just going to soak all this Autumn in and give you guys some of my favorite Spooky, and just plain seasonally appropriate cocktails. Creaking door noises. Ghoulish wails. Someone breaking your favorite antique champagne coupe! THE HORROR!!! Halloween is a holiday that transitions nicely from childhood to your drinking years. But don’t think that means you need to be serious. Are you a mad scientist this year? Perfect, there’s some glassware for that. Going more the cannibal route? Then giant skull punch bowl it is! If you’re done with the silly stuff, then make sure your booze is wearing a little black dress, and then decide whether to risk the nice glasses for serving or just some fancy paper cups instead. Me, I’ll be serving up some blood… blood oranges that is. Happy Haunting folks! For more gift guides than you could possibly need, click here. Monday Booze News All the candy inspired cocktails you can shake your muddler at! GIVEAWAY! We’re giving away a copy of the Essential Scratch & Sniff Guide to Becoming a Whiskey Know-It-All. Pumpkin beer. You know you want it. These Los Angeles ladies are going to make you a great drink! Orange Wine! For Halloween! Or whenever. It’s a thing you should drink. Regardless of how many fancy cocktails I make, Buzzfeed is there to remind me that everyone just wants to drink vodka shots with Emergen-C.
I’d like a bold red to have with my peanut butter cups please! And more ways to pair your Halloween candy with wine. Looking for a spooky garnish for your cocktails this week? Here’s a few to try. Just add rum: Pumpkin Spice Boba Tea!!! Get your candy flavored cocktails at these bars across the country. Or maybe make your own? Like these candy corn shooters. (Make at your own risk). Hey kids! This months Low Rent Cocktail is a layup. That Halloween party you threw Saturday night? You’re going to have one rager of a hangover Sunday morning. The solution: more booze. And candy. Candy is always the answer. Just before you passed out into oblivion I bet you tossed a bunch of candy corn into an almost empty solo cup of vodka. Well, that sat overnight and turned into a magical elixir… of candy corn syrup… that you can shoot back and start your day. Ok, first you need to take off that Vampira makeup. Or are you still in your Teen Wolf costume? Either way, this drink is going to put things back into perspective. Maybe next you should go find a chili dog. 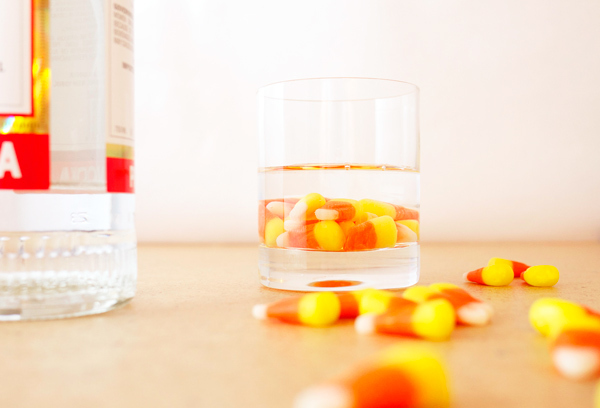 Toss the candy corn into the vodka and let that sit overnight, or at least 4 hours. The candy should have broken down at this point, so give it a stir, and toss it back. It’s a thick, syrupy, candy corn flavored elixir. 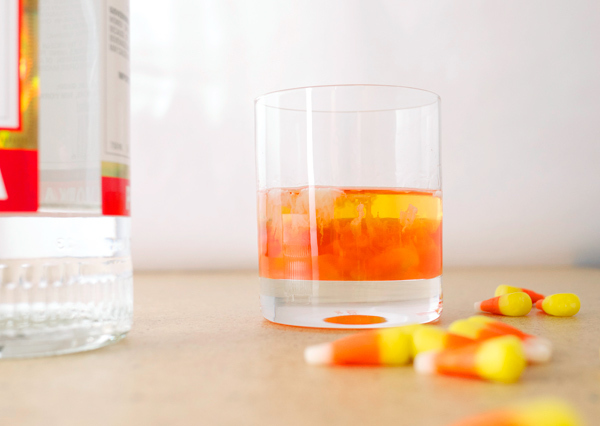 Unless you plopped your candy corn in some rum, then it’s going to be rum and candy corn flavored. You get the idea. Happy Halloween everyone! If you need some monster-inspired music, check out the #songaday selections on my Twitter. Cocktails will resume in November!